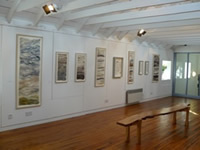 In February/March 2005 I spent some time as resident artist at the Booth in association with Bonhoga Gallery in Shetland. This little purple shed, perched on the waterfront overlooking Scalloway harbour, became my base while I explored the extraordinary diversity of the islands. I have returned several times since then and have been working on a series of large pieces inspired by Shetland light and landscape. In the new work I'm using the natural colours of Shetland wool fibres and combining them with silk and flax to make thin, almost transparent hangings. 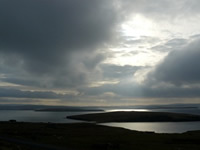 I hand stitch them and sew in fragments of photographs which illustrate aspects of Shetland life. I became interested in Shetland lace knitting after seeing some beautiful examples in the new and wonderful Shetland Museum in Lerwick. 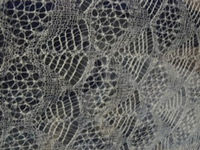 Knowing that I would never be able to master the intricacies of this traditional craft, I decided to see if I could make a version of lace knitting on an industrial knitting machine. In September 2007, with encouragement from the staff at Shetland College , I was able to spend 2 weeks in the textile department experimenting on a large and intimidating Shima Seiko machine. 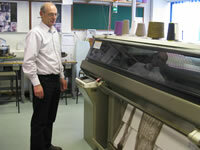 Guided by technician Eric Stewart, I used single ply Shetland wool to produce lengths of lace-like knitting. Back in the studio, I have been treating the knitting with dye, ink, wax and varnish before using it in my felted and hand stitched pieces.